The Shotgun Range is a private range for use by LGC members and invited guests. 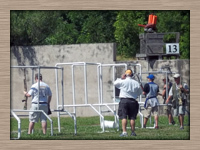 The Shotgun Range is operated by a volunteer committee and Shotgun Range Safety Officers. Guests and Junior shooters (under 18 years of age) must be physically accompanied by an LGC member. 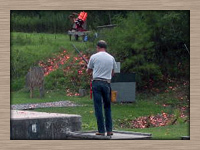 The Shotgun Range may be used only under supervision of a qualified Shotgun Range Safety Officer (SRSO). Saturday's from 1100-1700 or dusk and Sunday's from 1200-1800 or dusk. As with all outdoor ranges, a qualified Range Safety Officer (RSO) must be on duty whenever firing occurs, in accordance with York County ordinance. A red flag flying on the flagpole by the SRSO shack indicates an SRSO is present and the shotgun range is in operation. Fees are $3 per round for LGC members, their spouses, and all youth (18 and under); and $5 per round for adult guests. A "round of birds" is 25 thrown clay targets. Fees are set to cover costs of operation, including maintenance and replacement of equipment. Standard Trap. Up to five shooters take position on a marked set of concrete sidewalks, from 16 to 27 yards behind the trap house. All shots are at outgoing birds that the trap will throw at a fixed elevation angle but at random angles to left and right. The shooters call and shoot in turn until each has fired 5 shots. All shooters then shift one position to the right, and five more shots are fired. This sequence is repeated until each shooter has fired from all five positions and expended 25 rounds. Wobble Trap. Up to five shooters take position on a set of elevated wooden platforms just behind the trap house. All shots are at outgoing birds that the trap will throw at random angles, both in elevation and to the left and right. The shooters call and shoot in turn, shooting a single bird on the first rotation through the squad and then report pairs on the second and third rotations. All shooters then shift one position to the right, and five more shots are fired. This sequence is repeated until each shooter has fired from all five positions and expended 25 rounds. This is a good game for beginner shooters. Standard safe gun handling is required and will be enforced by the SRSO. A brief summary of rules is as follows: Load your gun/close the action only when you are ready to call the bird and fire on it. Only shot sizes 7 ½, 8, and 9 may be used on the Shotgun Range. Larger shot or slugs may be fired only on the 50 yard rifle range, under supervision of a Range Safety Officer. Actions must be open and muzzles pointed in a safe direction when moving about the range. The duty SRSO has absolute authority to enforce range rules. His/her interpretations are binding on all shooters and onlookers. The LGC Board of Directors has chartered the Range Committee to operate the Shotgun Range. The committee manages the operation of the range, procures consumable materials, arranges for range maintenance, provides training for Shotgun Range Safety Officers, and sets the hours of operation and the fees for the range. The Range Committee reports to the LGC Board of Directors monthly, including summary of operations and usage.